Overview - Gus Lobel (Clint Eastwood) has been one of the best scouts in baseball for decades, but, despite his efforts to hide it, age is starting to catch up with him. Nevertheless, Gus—who can tell a pitch just by the crack of the bat—refuses to be benched for what may be the final innings of his career. He may not have a choice. The front office of the Atlanta Braves is starting to question his judgment, especially with the country's hottest batting phenom on deck for the draft. The one person who might be able to help is also the one person Gus would never ask: his daughter, Mickey (Amy Adams), an associate at a high-powered Atlanta law firm whose drive and ambition has put her on the fast track to becoming partner. Against her better judgment, and over Gus's objections, Mickey joins him on his latest scouting trip to North Carolina, jeopardizing her own career to save his. Together, baseball and Hollywood have a long standing history full of tear-jerking cinema. Steeped in misty-eyed nostalgia and wholesome Americana, the sport has become a defining symbol for our country -- and the movie industry has used that sentimental grandeur to full effect, resulting in enjoyable classics like 'The Pride of the Yankees,' 'Field of Dreams,' and 'A League of Their Own.' Attempting to reach those same inspirational heights, 'Trouble with the Curve' offers yet another motion picture swing at America's favorite pastime. While the well-meaning effort is sweet and reasonably entertaining, the saccharine story feels old fashioned, generic, and overwhelmingly predictable. To use a baseball metaphor (and really, how could I not?) the film lands on all the expected bases, but can't quite slide into home. Gus (Clint Eastwood) is an aging baseball scout working for the Atlanta Braves. When his ailing vision places his job in jeopardy, his daughter, Mickey (Amy Adams), decides to take a break from her burgeoning law career to help out. Hoping to heal their strained relationship, they hit the road together in search of talent. As they struggle to work through their personal issues, they also evaluate a potential draft pick -- but the supposed star player might not be everything he's cracked up to be. With emotional and professional pressures bearing down, the duo will have to make the right call or risk Gus' future with the team. The real heart of the story lies with its father/daughter dynamic, and thankfully both Amy Adams and Clint Eastwood are up to the task. Adams is likeable and convincing as the strong-willed Mickey. Her arc is pretty basic, but the actress elevates the role through natural charm and sincerity. Eastwood mostly sticks to his recent cranky old man routine, and while the part bears some resemblance to several of his past roles, the actor's trademark persona works well. Gus is grizzled, lonely, and temperamental, and Eastwood sells those frustrations admirably. The pair's attempts to bond and reconcile form the main emotional meat of the narrative, and much of the conflict stems from their striking similarities to each other -- something that both performers seem to enjoy playing up. Despite an extremely silly introduction, Justin Timberlake is also well cast as a fellow scout who serves as a love interest for Adams. Their budding relationship is a bit trite but, once again, the performances help to liven up the familiar plotting. Beyond Gus and Mickey's quest to solve their communication issues and the Adams/Timberlake romance, the script also deals with the challenges of aging and the pressures of a fast moving career. A thematic subplot dealing with changing times is thrown in as well, placing the old school tactics of Eastwood's character against the computerized strategies of younger scouts. This material all has merit, but the script fails to really delve deeply into any of its issues. Instead, the plot relies on tried-and-true beats that mostly breeze along the surface. Sure, there are a few effective dramatic moments and setbacks, but the majority of the leisurely paced runtime is rather one-note and flat, stretching out a decent family reconciliation arc for all its worth. The third act introduces some baseball draft drama in an attempt to spice things up, but this aspect feels rather forced. Likewise, the film's antagonist, played by Matthew Lillard, is exceedingly one-dimensional. Smarmy and devoid of any redeemable qualities, he's merely an obstacle, not a real character. Though Adams and Eastwood's pairing is the film's strongest link, a major flashback that's supposed to reveal the main source of their estrangement is very anticlimactic. Instead of shedding light on the characters' choices, it just seems clunky and tacked on. Filmmaker Robert Lorenz's old fashioned direction also doesn't help matters much. Don't get me wrong, the first time director does a serviceable job, but this is standard Hollywood execution through and through. It has some heart, but it lacks a true voice. While I don't want to give anything specific away, the movie's climax basically hits every cliché in the book (including one particularly groan-inducing reversal involving a peanut vendor). Every conflict is perfectly resolved, wrapping up the entire plot with a nice little bow. Seriously, just take the basic premise and then imagine the most formulaic, sugarcoated, and familiar conclusion possible, and that's exactly what you get. That's not to say that the results are necessarily bad, but the resolution is so neat, tidy, and syrupy that it robs the entire movie of any real weight. There are some effective roadblocks along the way, but the heartwarming finale is too easy and manipulated. 'Trouble with the Curve' aims to be a heartwarming, inspirational tale about a father, his daughter, and baseball. On paper that might sound like the perfect recipe for an eye-watering drama, but that's exactly the problem -- it's too perfect. The plotting and direction are as generic as they come, and while the movie hits all the right beats, they're all too familiar to really resonate. Still, Amy Adams and Clint Eastwood turn in good performances, and their characters' relationship does have a solid emotional core. Though it tries to emulate the mushy sentiment of previous sports themed classics, the film can't measure up to the schmaltzy greats. In other words, it's occasionally moving but isn't likely to make a grown man cry -- and aren't man tears the true hallmark of any great baseball flick? 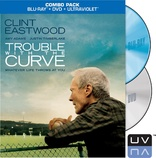 Warner Brothers presents 'Trouble with the Curve' in a Blu-ray/DVD/UltraViolet combo pack. A BD-50 Blu-ray disc comes packaged with a separate DVD, all housed in a keepcase with a cardboard slipcover. Instructions for a downloadable digital copy are also included. After some skippable trailers, the disc transitions to a standard menu. The movie is provided with a 1080p/AVC MPEG-4 transfer in the 2.40:1 aspect ratio. Sharp and highly detailed, the image is quite impressive, but the picture's stylistic choices might put off some viewers. As one might expect from a new release, the source print is in perfect shape. A very light layer of grain is visible throughout, and the transfer retains a filmic appearance with no unnecessary processing. Clarity is often exceptional, revealing every wrinkle of worn character on Eastwood's iconic mug. Fine details like striped patterns on suits, and tiny links on fences are all rendered clearly and distinctly. Several scenes also offer a life-like sense of dimension. The color palette veers toward a very teal look, and while some might dislike this style, in this case I actually wasn't too bothered by it. Though limited, the predominantly blue, green and red hues are still rich, and some shots offer impressive pop (especially wide shots of the vibrant baseball fields). Contrast is high, and a few outdoor sequences have a fairly blown out look. As a result, the intense white levels do occasionally obscure some detail. Thankfully, blacks are inky and consistent. 'Trouble with the Curve' has an intentionally stylized aesthetic that favors hot contrast and a teal color palette. While this can lead to a comparatively harsh look in several scenes, the picture maintains a striking sense of clarity and depth. Some viewers may find the look to be unappealing, but I was mostly impressed by the resulting image. The film is provided with an English DTS-HD MA 5.1 track and Spanish and French Dolby Digital 5.1 tracks. English SDH, Spanish, French, and Portuguese subtitles are also available. Spacious and nuanced, this is an impressive mix that immerses the audience without overpowering the content. Dialogue is clear and full-bodied, and despite Eastwood's tendency to speak in low grizzled tones, speech is always audible. Aggressive sounds, like the hard clank of a metal bat smacking into a baseball, carry a palpable kick. Crowd reactions hit the rears during games, and other ambient effects like rain offer a delicate but enveloping sense of immersion. Restaurants, bars, and parking lots are given an extra splash of auditory texture through subtle atmospherics and discrete noises (car ignitions starting in the background, for instance). Directionality is natural, isolating specific noises (like door knocks) around the soundfield, and audio pans feature smooth imaging. Dynamic range is wide and low frequency activity is deep when called for. Nicely balanced and full of subtle texture, the mix does a great job of enhancing the film's unassuming atmosphere. This might not be a traditionally flashy track, but the design work is actually quite strong, opening up the movie's soundfield in small but effective ways. Warner Bros. has included a disappointingly slim and disposable set of special features. The extras are presented in 1080p with Dolby Digital 2.0 sound and the same subtitle options as the main film. For the Love of the Game (HD, 6 min) - This is a brief behind-the-scenes featurette with cast & crew interviews that offer details on the characters. Filled with requisite mutual complimenting, this is pretty useless. 'Trouble with the Curve' is neither a home-run nor a complete strikeout. Resting between heartfelt and sappy, the film offers a pleasant but forgettable watch. The performances are good, but the well-meaning script and direction are disappointingly generic. While the film's visual style might put off some viewers, the video transfer is strong, and the audio mix is great. Unfortunately, supplements are very lacking. Flawed but enjoyable, the movie is a solid rental.